A down on his heels private eye attempts to reunite with his ex-wife. With his latest offering, After the Storm, Japan's Hirokazu Koreeda completes a loose trilogy of films that collectively explore the fluidity of family units. 2013's tear-jerker Like Father, Like Son examined the question of 'nature vs nurture?' in the story of a father who learns the child he has raised isn't actually his birth son, thanks to a hospital mix-up. In last year's Our Little Sister, a film with a heart as warm as the sun, three siblings accept the step-sister they never knew existed into their home. With After the Storm, a traditional family unit has collapsed, but the patriarch is determined to restore the status quo, regardless of whether it's the best course of action for all involved. Recently divorced, Ryota (Hiroshi Abe), the one-time author of an acclaimed novel is struggling to make his child support payments thanks to an addiction to gambling, and an addiction to losing. Using the resources of his job at an unscrupulous Private Eye agency, he spies on his ex-wife Kyoko (Yoko Maki), and is overcome with jealousy when he discovers she has entered a new relationship with a successful businessman. Ryota's a trainwreck, the sort of schmuck only a mother could love. Luckily for him, she does. The mother in question, Yoshiko (Kirin Kiki, an actress who possesses my favourite face in today's cinema), sees too much of her hapless husband in her son, and she's torn between wanting the best for him and realising that he simply may not be cut out for fatherhood. It's a well worn trope in cinema for movies to manipulate us into rooting for a father when the question of child custody is raised, no matter how unsuited he appears to be for the task. Ex-wives are cruelly portrayed as cold and calculated, simply because they've eschewed goofing around in favour of providing for their child. After the Storm is a refreshingly welcome subversion of this tradition. Though he possesses a certain charm, with a twinkle to his rugged features, and he means the best, Ryota is an absolute mess, and the film makes this all too clear. His ideas of fatherhood seem based on a checklist - buy the kid shoes, play some baseball with him, take him for a burger too big to fit in his mouth - rather than any natural paternal instinct, and we fully understand why Kyoko appears eternally stressed in her ex's presence. It would take a cold heart to deny him access to his son, but only the most deluded of Men's Rights Activists could wish for him to reunite with his long-suffering former spouse. Koreeda makes character dramas in which character takes precedence over drama. At times his protagonists can feel like wind up toys that have veered off course, and where other filmmakers might reign them in to benefit a neater plotline, Koreeda is happy to let them ramble off. His films are all the better for it, and it's why the people that populate his work feel more human (flawed, but generally well-meaning) than those found anywhere else in modern cinema. At times they may be inconsistent - Yoshiko seems to flip flop on whether she wants to reunite Ryota and Kyoka or encourage her son to move on - but humans are, aren't we? Even the supporting characters that pop up intermittently here - Ryota's sister/money-lender; his pretty young assistant at the PI firm; Kyoka's well-groomed new lover - feel like they're carrying their own invisible weights, and if the movie decided to change course and follow any one of them, we get the sense Koreeda could pull off a drama as equally engrossing as the central story he's ultimately opted for. After the Storm may not quite hit the peaks of the director's recent modern masterpieces, but even second tier Koreeda is essential cinema, and any opportunity to witness Kirin Kiki's wonderfully wrinkled face break into a smile is worth seizing. 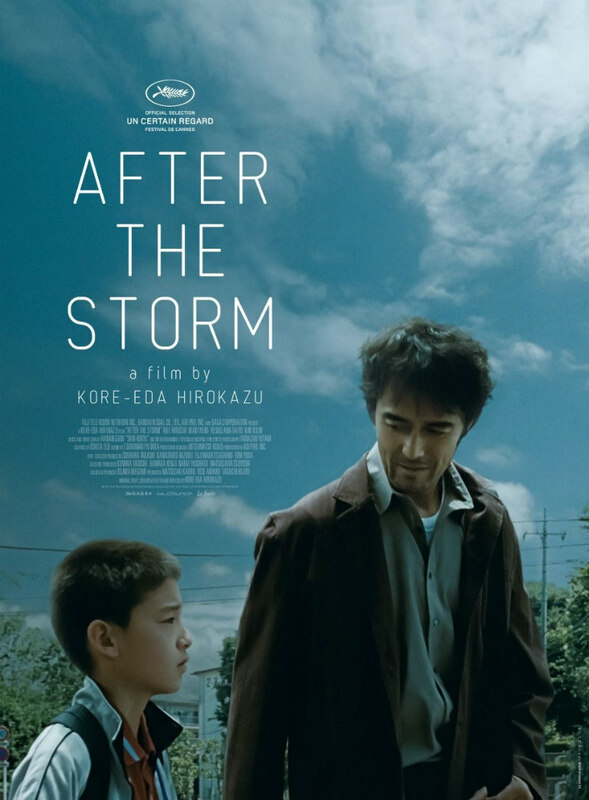 After the Storm is in UK/ROI cinemas June 2nd.